Cheese Plate of Roquefort, Cabot Extra Sharp Cheddar, Chianti Salami, Honey Crisp Apple slices with Alaskan Fire Blossom Honey, and Mini Baklava. We decided to wait and choose the wine at the last minute. There were several wine deliveries we were expecting from Turley, Ravenswood, and Carol Shelton. In the end, Mr. Dr. decided to go with a 2011 Turley Petite Sirah. After going to the store for ingredients, we rolled up our sleeves to start cooking. Since most of the items on the menu were fairly quick to make, we decided to do the Marchand de Vin sauce properly. We first made an Espagnole sauce, the “mother sauce” for Marchand de Vin. While the sauce reduced, I fabricated the duck (we couldn’t find just duck breast for sale, so we got a whole duck and decided to make confit and stock with the leftovers). With the duck prep work done, we turned our attention to the Baklava. Cathy took the reins on the desert, and the recipe she came up with was pretty awesome. She used a combination of Pistachios, Walnuts, and Almonds in her filling. They were mixed with spices and the fire blossom honey and put into mini filo cups. 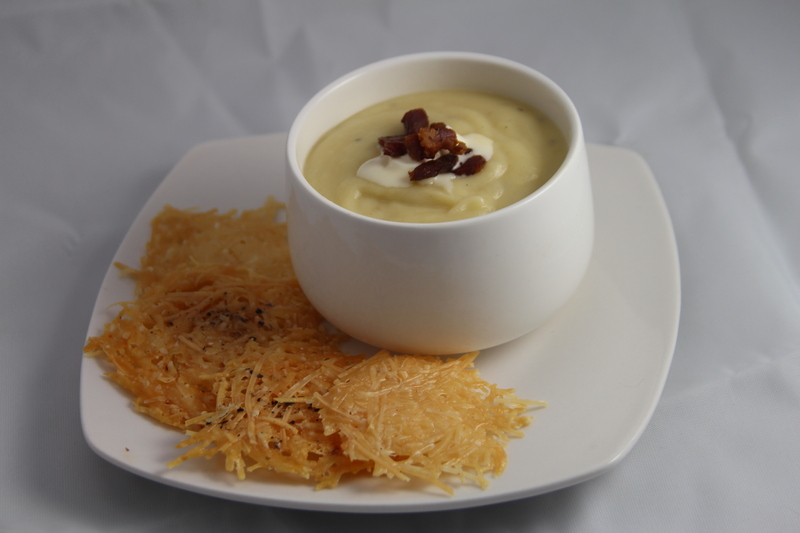 We have done potato-leek soup before, and decided then that it needed more texture. I suggested bacon lardons, while Mr. Dr. wanted parmesan crisps. In the interest of deliciousness, we did both. I prepared the soup with fresh leeks from the garden, while Mr. Dr. prepared two types of parmesan crisps – one with pepper, and one plain. Cathy prepared the pot stickers, while I finished the duck. The pot stickers proved very fiddly, with many small wonton wrappers to be folded, but were well worth the effort. The duck was seared off, then moved to the oven to finish. Then, it was time to plate. Cathy brought her light box with her to this dinner, so we were able to get pretty good pictures of the food as it was plated and brought to the table. 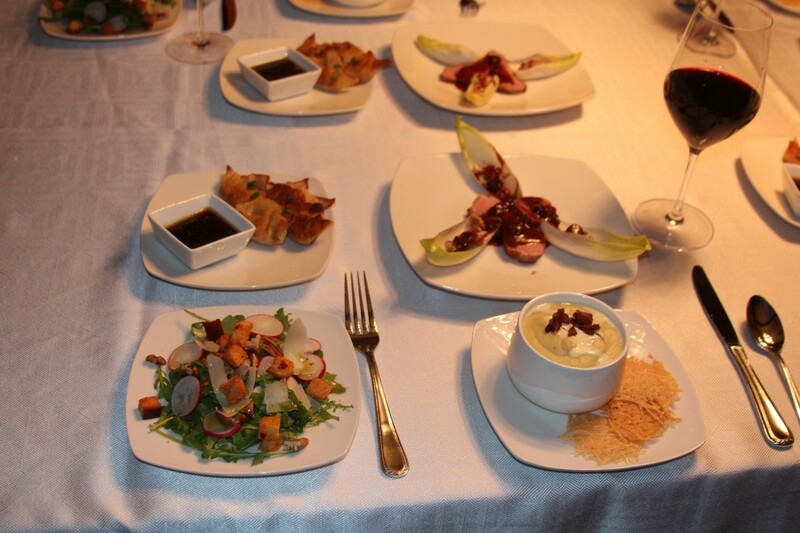 Typically, when you have a small plates dinner, you eat it in courses. However, in the interest of just sitting down and eating, we brought everything out at once. That definitely showed the differences in the flavor profiles of the dishes. The salad and the soup went reasonably well together, but were seriously overpowered by the strength of the pot stickers and the duck. If they were served in courses, with the intensity slowly ramped up it would have worked well, however, going from the pot stickers to the soup was like brushing your teeth then drinking orange juice. The Turley Petite Sirah went reasonably well with the meal, though the pot stickers heat was amplified by the high alcohol content. The duck went particularly well with the chosen wine. The strong fat of the duck was more than a match for the tannin in the wine, and the pepper finish of the wine played very well with the endive and sauce. Desert was pushed back for an hour or so. Apparently, “small plates” is relative. I confess I was defeated by the dinner and needed some time to digest before diving into the finale. 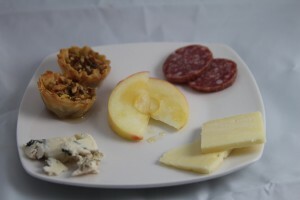 Clockwise from upper left: Mini Baklava, Chianti Salami, Cabot Sharp Cheddar, and Roquefort, with Honey Crisp Apple and Fire Blossom Honey in the middle. Zinfandel 2011. The wine was not very good alone, and in fact we checked to make sure we opened the right bottle and not a throwaway with a similar label. After a few minutes, and with the addition of food, the wine opened up fairly well. Analysis of the dinner showed a few things we could change for next time, as well as a difference of opinion on some matters. The plating of the duck could have been done better. While it looks very good as is, it was best eaten by cutting the duck up and putting it into the endive leaf, then eating it like a small taco. That was more work than necessary and next time I would do the chopping and mixing before putting it on the plate. I felt the parmesan crisps were too strong on their own and needed to be broken up into the soup for best effect. Cathy accused me of blasphemy as she happily dipped her crisp in her soup like an Oreo in milk. In all, the menu was sound. It would have benefited from being served in courses, and with individual wines selected to go with each individual course rather than an overall selection. However, I feel the chosen wine was up to the task and went reasonably well with everything. Remember, if you don’t know what wine to pair with the food, just pick one you want to drink and pairing be damned. Chicken Stock, enough to cover the potatoes, about a quart (preferably homemade). 1) In a large pot over medium heat, melt butter and add the leeks and onion. Cook, stirring until leeks are limp. 2) Add potatoes and cover with stock. Cook until potatoes are tender. Use stick blender to puree mix and add heavy cream. Blend until smooth. Salt and pepper to taste and continue to cook for additional 10 to 15 minutes. 3) Meanwhile, cook the bacon lardons in sauté pan until just crispy. Drain and reserve. 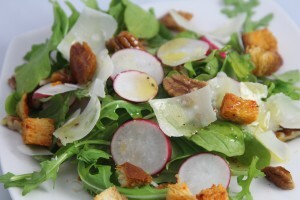 4) Place the parmesan cheese in small piles on a silicon mat or wax paper and melt in oven under broiler. 5) When everything is ready, place desired amount of bacon in bottom of bowl, add soup and top with Crème fresh. Serve warm with parmesan crisps. 1) In a sauté pan over medium high heat, melt butter and sesame oil together. Add the sausage, cabbage, onion, garlic, ginger, and green onion and sauté until sausage, onion, and cabbage are cooked. 2) Place mixture in food processer and pulse until finely chopped. 4) Pan fry pot stickers in a mixture of olive oil and sesame oil until browned on both sides. Drain on wire rack or paper towels. 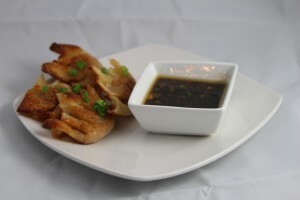 5) Wisk together all ingredients of dipping sauce and serve with the pot stickers. 2 duck breasts, skin and fat still on. Cross hatch slice the skin on the duck. 1) Make the roux by melting butter in sauce pan over medium heat. Add the flour in 1 tbsp increments and stir well until it forms a paste. Cook slowly over medium heat stirring regularly until it begins to brown. Remove from heat and reserve. 2) Heat oil in saucepan over medium heat. Add onions and sauté until translucent. Add carrots and celery and continue to brown. 4) Add the stock and bring to simmer. 5) Whisk roux into stock and bring to simmer again. Add the Sachet d’epices and simmer for 1 hour. Skim top as necessary. Strain sauce and season with salt and pepper as needed. 1) Combine shallot, thyme, bay leaf, peppercorns, and wine in a saucepan. Bring mixture to boil and reduce until syrupy, 5-10 minutes. 2) Add Espagnole sauce and reduce until sauce coats back of spoon, 8-10 minutes. Strain sauce and return to sauce pan. Add dried cherries and season with salt and pepper. Simmer until cherries are rehydrated, then finish by swirling in butter. 1) In a cast iron pan, or other oven safe pan, sear the duck skin side down until crispy, flip over duck and move to oven. 2) When duck is crispy (about 8-10 minutes) remove and allow to rest for at least 5 minutes. 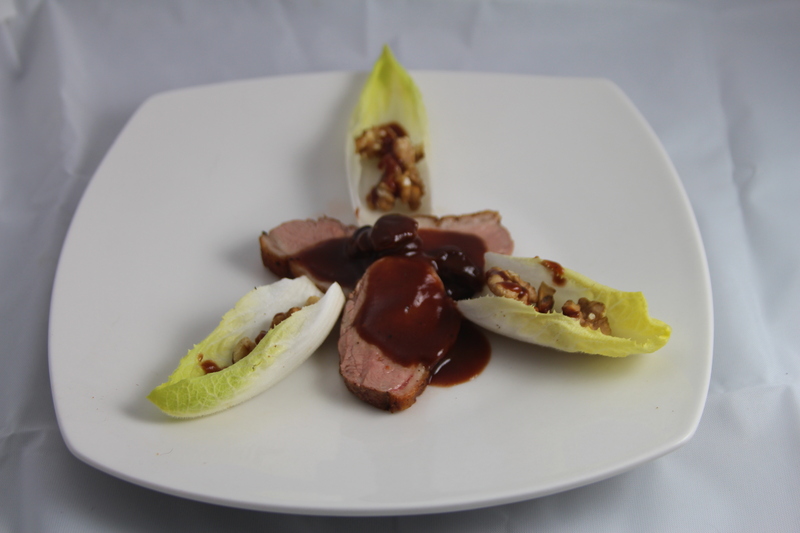 3) Slice duck and serve with walnuts, endive and Marchand de Vin sauce. 2011 Turley Wine Cellars Rattlesnake Ridge Petite Sirah, Howell Mountain. From the Turley Site: Above St. Helena on the north eastern ridge of Napa Valley, the Petite Syrah from Rattlesnake Ridge Vineyard is another fantastic expression of Howell Mountain. Dark, powerful, inky, funky; this sun-drenched but cool & windy site brings out the best characteristics of Petite Syrah. Mailing list only. Estimated price: $100.00 at auction.